Purely mathematical magic items are often boring and certainly do not create memories at the table. The much maligned ring of protection +1 is a great example which has been a staple of the Dungeons & Dragons game for ages. I always like to add a twist to the more common magic items I give out to my players to keep them on their toes. Magic needs to be wondrous and unpredictable so even the oldest grognards are surprised. Below I have created a table of additional powers that will spice up the next ring your group unearths. 1) A golden band that itches when worn for longer than five minutes. If removed a scaly rash is left behind which contains small indecipherable runes. If scratched the rash will bleed slightly and then vanish charging the ring. The owner of the ring then temporarily loses 1 hit point. 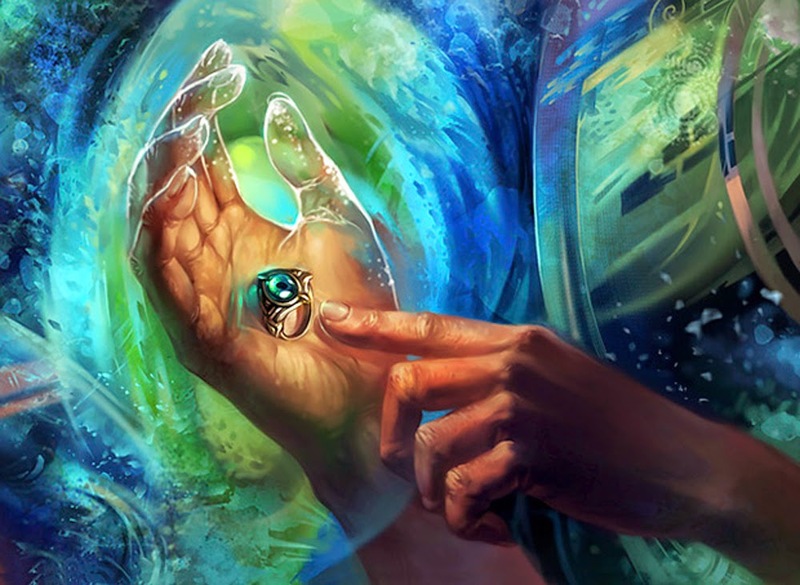 Once per day the owner of the ring may re-roll all the dice of one healing power affecting them. 2) Polished hematite ring covered in miniature superimposed eyeballs which follow the wearer. When worn waves of nausea will continue until the wearer makes a difficult constitution check. Once composed the ring provides 360 degree vision for up to one hour per day. The owner of the ring will gain strong reclusive behavior traits and their hair will become fine and silky. 3) A multicolored cloth ring seemingly created from several twisted scraps of clothing. If placed on a finger or toe several small stitches will appear. If one of the former is pulled it will empower the wearer will a small burst of wild magic. Any spell cast afterwards will have one of the following random effects (1d4): 1. Spell fizzles 2. Spell forks to an extra target 3. Spell does the minimum effect. 4. Spell works but is not consumed. The ring produces 1d2 stitches per day. 4) Square shaped red crystal ring which is filled with swirling smoke. When worn the owner will emit a strong acrid smell wherever they go. After one day the finger upon which the ring resides will turn blackened and charred. It will move freely and be completely pain free. 1d4 times a day the finger can create a spark if dragged against stone as if tinder and flint was used. 5) Spongy ring with the consistency and texture of flesh. Upon closer examination small warts and clumps of hair can be seen upon the band. If worn it seeps into the host finger making the attached appendage elongated, deformed and incredibly strong. This will grant the wearer of the ring +2 to strength in that arm but also -4 to charisma when the arm is exposed. All attempts to retrieve the ring save a remove curse spell will fail. 6) A band created from what appears to be fresh rough cut bark. The smell of conifers can be detected all around the ring. When worn the skin of the user will turn green instantly. Soon thereafter scaly pine cones will form on the wearer’s skin. This may be easily removed or plucked and if thrown will cast entangle on the target area. 1d2 cones are produced per day with the caveat being they must be used within five minutes or become inert. 7) Large gaudy ring which is completely socially impractical and obnoxious. Upon wearing the ring the owner will desire opulence and excess. There is a 50% chance per day the ring wearer will spend all available wealth on being pampered. This desire is so strong that the wearer is unembarrassable and immune to magical fear until adequately lavished. All attempts to retrieve the ring save a remove curse spell will fail. 8) Old bone ring with small chew marks marring its surface. If placed on a finger the wearer immediately feels the hair on the nape of their neck rise. Then for some inexplicable reason they are able to covertly sense the presence of unintelligent undead within 60’. This “blessing” however comes with a heavy toll as intelligent undead within 1 mile will seek the wearer out. Additionally intelligent undead will always attack the wearer of this ring first.